Journalist Randi Kaye reported CNN's New Year's Eve Live from Denver, Colorado on Sunday night. During her segment of the larger show hosted by Anderson Cooper and Andy Cohen in New York City, she toured with revelers on a 'Cannabus' and attended a 'Puff, Pass and Paint' party. Recreational marijuana usage has been legal in Colorado for adults of at least 21 years of age since January 2014, with the formal enactment of Colorado Amendment 64. The amendment was passed by voters 55 per cent to 45 per cent in November 2012. Back in 2014, Cooper was left chuckling during a segment in which Kaye, 50, was at a marijuana dispensary in Colorado. 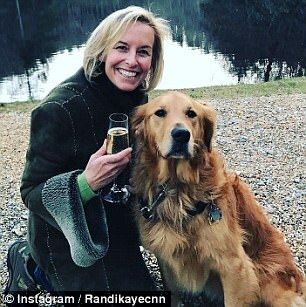 Last night provided similar comedy as viewers were left wondering whether Kaye might have gotten something of a contact high over the course of the evening. Not inhaling herself, the journalist was nonetheless surrounded by smokers on the 'Cannabus,' a touring bus on which revelers can enjoy marijuana. 'We have the party started here. There is a little bit of purple haze. We call this the magic bus. The CannaBus, get it?,' Kaye tells Cooper and Cohen around 9pm Eastern Time, or 7pm Mountain Time. A man behind her is seen lighting up as she talks while the bus is traveling near a dispensary called Medicine Man. 'Whoa,' she says, as the man blows smoke right at the camera. She then speaks to a man called Mikey about his 'Blazy Susan,' which has all the apparatuses needed for smoking marijuana on one circular tray. She also asks Andy Cohen if he wants her to pick anything up for him, and he requests Cheeba Chews, which are a marijuana-infused taffy candy. Cohen wonders if she might eat any herself. 'Dose yourself properly, Randi. We don't want any trouble from you,' he says. 'No, not at all. She's just very game to report and go to the front lines on things,' the more serious Cooper replies. Catching up with Kaye later in the evening, viewers learn that she has earned the nickname 'Kush Kaye'. She helps a man light up the gas mask bong, at which point Cooper, in New York, covers his face. 'I don't think this is really what a gas mask is used for, but, wow! Okay! This is New Year’s Eve Denver style,' Kaye says. Cooper quickly reminds viewers that what they are seeing is legal in Colorado. 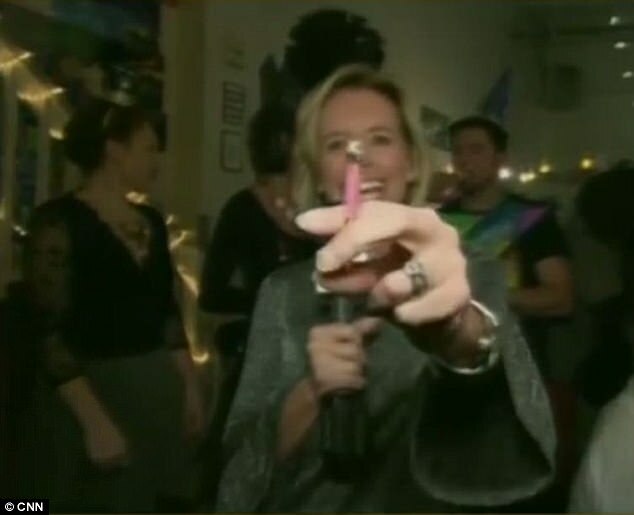 Later, at a 'Puff, Pass and Paint' party, Kaye is shown laughing quite heartily. Meanwhile she holds out a joint and says it is for Andy, who is more than 1,600 miles away. She then gives it to a party attendee and describes how the marijuana the party-goers are smoking informs their creativity with regard to their paintings. 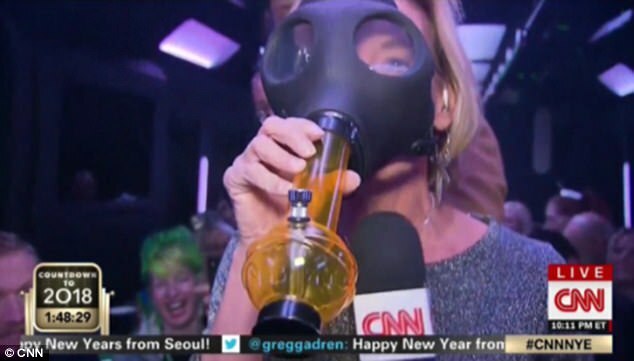 Twitter was divided on the segments, with some praising Kaye for her hilarity and others taking offense that she was in the presence of marijuana smokers on live television. Meanwhile, California ushered in 2018 by opening retail cannabis shops for the first time.